In November 2009, the New South Wales Government introduced a levy on coal washery rejects of $15/tonne . This levy has the stated aim of helping stimulate alternative disposal arrangements for rejects. The levy, however, does not apply where rejects are used for active mine rehabilitation, abandoned mine rehabilitation or resource recovery, and hence the levy should not apply where coal rejects are used for power generation, that being a resource recovery operation. The United Nations Framework Convention on Climate Change (UNFCCC) recognises that Ventilation Air Methane (VAM) is a significant source of Greenhouse Gas (GHG) in its methodology ACM0008 . The production of VAM thus has ramifications for industries that utilise coal (for energy and chemical feedstocks), including the coal-fired power industry, in terms of their carbon footprint. Coal washery rejects and VAM are, however, fuels that can be jointly utilised for power generation and in the case of VAM that utilisation can significantly reduce the carbon footprint of an underground coal mining operation by converting the methane with a Global Warming Potential (GWP) 21 into carbon dioxide GWP 1. The challenge is to be able to use coal wastes (a resource of low grade mined fuel that has largely been overlooked) with VAM (another very marginal fuel) in such a way that maxim usable energy is extracted from the wastes and VAM and that methane contained in the VAM is converted to carbon dioxide, thus reducing the overall greenhouse footprint of coal mining and conserving virgin coal. In this paper the primary process of choice is gasification followed by direct gas utilisation, a technology that is innately more efficient at the scale of operation that is being proposed than straight combustion with power generation using a steam cycle. VAM is methane contained in the out-by ventilation system of an underground coalmine. Its concentrations vary from barely measurable to over 1% with 0·6% being a reasonably common concentration for moderately gassy mines. (Note: In a gassy mine the VAM concentration is largely controlled by the level of ventilation provided by the mines ventilation system, with the VAM being continually monitored and the ventilation being adjusted to maintain safe underground concentrations.) Under normal working conditions, VAM concentrations are far below the lower flammability limit of 5% methane in air and thus VAM needs a secondary source of fuel (energy) to be converted (burnt) into carbon dioxide and water vapour. A suitable secondary fuel is colliery wastes, fuels that commonly contain significant coal values and have specific energies (SEs) of say 12  20 MJ/kg. The colliery wastes may include pit wastes, mined but unsaleable coal plies, coarse washery rejects and fine rejects. Washery middlings could also be used. The material utilised may be as found or where fines are significant, pre-processing that could be briquetting or pelletisation would be required. A general scheme of turning coal wastes and VAM into useful energy is presented below in Figure 1. 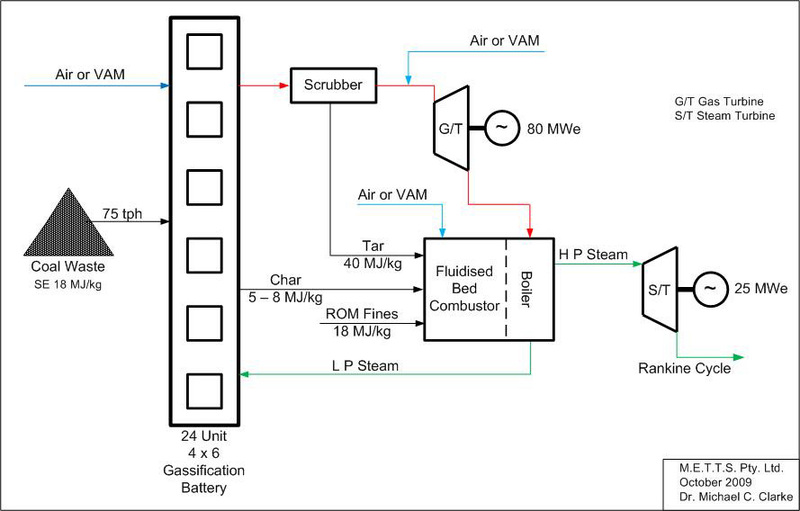 The plant shown in Figure 1 is an air blown gasification system for coal wastes that can utilise VAM (say to >1 CH4 v/v). The gross output of the plant would be 105 MWe, with a net output of around 100 MWe. 7. It would earn greenhouse credits. The solid fuel that is suggested for the system is waste coal that could be a mixture of washery rejects, washery middlings and pit wastes. In Figure 1 it is given a nominal SE of 18 MJ/kg. The VAM would have an SE of around 0·25 MJ/scm at 0·6% CH4 v/v. The VAM contribution to the total raw energy input would be around 5  10%. The energy efficiencies of the total system, as well as being dependent on the quality of fuel, the specific efficiency of individual items of plant, and the plant complexity and extent of heat recovery, would also be influenced by the operational mode (i.e. supplying peak or base load) through energy losses during start-up and shut-down. 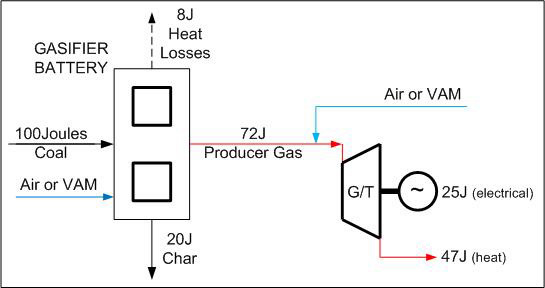 The production of producer gas in the gasifier and scrubber combination is given an overall efficiency of 72% , the char accounts for 20% of the energy input, and heat losses (specifically in the scrubbing operation) at 8% of the energy input. Note: The energy input is taken as being 100 joules (J) from coal wastes (or waste coal and VAM). VAM use would marginally increase the output of the Gas Turbine (G/T), which is given an efficiency of 35% in open cycle operation mode. 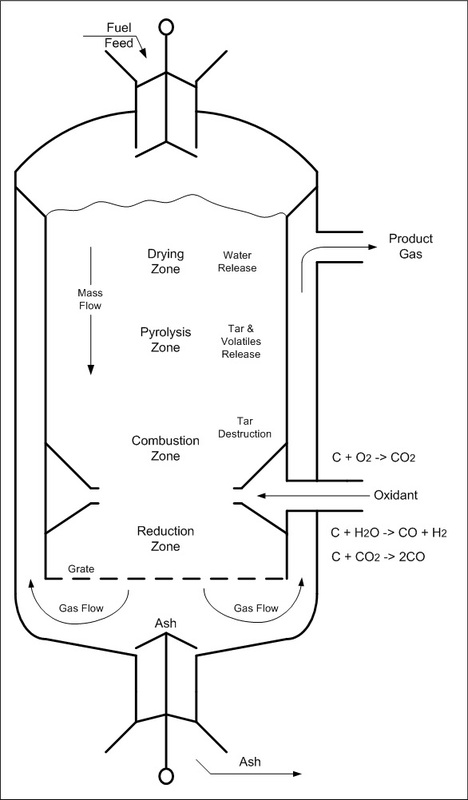  the availability of oxidants in the burn-out zone of the gasifier. In Figure 1, the char is shown as being a primary fuel for the FBC. If the burnout were very high (through the gasification of high VM wastes), the need for the FBC would be reduced with regard to the system aim of producing a low carbon ash. The ash content of the wastes would partially determine the efficiency of the total carbon burnout. Very high ash coal wastes would produce a total system lower efficiency, produce an ash with a higher carbon content, and require a higher internal power demand. Note: Ash from such wastes could possibly still be liable for a pro rata imposition of the NSW washery waste levies, depending on their ultimate disposal destination and whether they could be classified as remediation materials or not. It proposed that a down-draft gasification (DDG) system be utilised. The main advantage of the DDG is that the process destroys tars, compounds that are very hard to manage in other small-scale gasification systems. Secondly, the steam demand for oxidising char will be supplied from the moisture content of the fuel to a large extent. If more steam (water) is required for ensuring that the water gas reaction is enhanced as far as possible, then steam could be added with the air - oxidant. In the gasifier shown in Figure 3, the hot gas product is utilised in heating the incoming fuel (coal waste) feed. The oxidant, air (plus steam if required), would be entering the hottest zone of the hearth. If air were to be replaced by VAM, the contained methane would be combusted in this hot zone. Note: Any methane that survived the gasifier would be combusted with the producer gas in either the gas turbine or the FBC. Options for the destruction of VAM were examined by Mallett and Su  CSIRO 2004 . These researchers listed a number of technologies in various stages of development, with one technology hybrid waste coal/tailing/methane combustion in a fluidised bed, being classified as being proposed as a concept. Mallett and Su did not consider gasification as a means of VAM destruction or utilisation. With FBC destruction or utilisation, Mallett and Su stated that, with regard to the hybrid waste coal/methane fluidised bed combustion, there is no experimental study yet that proves the methane can be fully oxidised in a fluidised bed combustion unit even if full oxidation is expected. It is recommended that tests of this hybrid waste coal/methane fluidised bed combustion should be carried out before the development of a larger-scale unit. In a paper by You and Xu  Tsinghua University, 2008 , an experimental study is described that conclusively proves that methane is burnt completely in circulating fluidised bed furnaces. The CFBC was operated at 850°C with the VAM concentration set at 0·33% CH4 V/V. With FBC operation there should be no reason not to utilise VAM if it is available. You and Xu found that using VAM at 0·33% CH4 in place of air, a coal saving of 4·3% could be achieved, and concluded that, the economic benefit from coal saving insures the proposed system [is] more economically feasible, and if a project is financially supported by the CDM (Clean Development Mechanism), more income can be realised. Fluidised Bed Combustors are very suitable for burning poorer quality and mixed fuels. Their thermal inertia is more forgiving than pulverised fuel combustion. If a simple VAM combustion system with heat recovery and power generation is desired, a (C)FBC would normally be the system of choice over a range of sizes ranging upward of 25 MWe to say 200 MWe. For small-scale plants producing from 10 MWe to 50 MWe that have a readily gasifiable high volatile fuel and a small VAM load, a system of gasifiers followed by turbine (or engine sets) would be the answer. If the efficient use of energy contained in solid mine wastes is a priority, with fuels of moderate or variable gasification potential, then a hybrid gasification/combustion system should seriously be considered in the output ranges of 25 MWe to say 400 MWe. The power output split between the turbine sets and the steam system will be determined by the fuel characteristics, the total plant size and the desired flexibility of operating between peak and base load output. Note: Producer gas storage could satisfy a major peaking load demand, with the use of turbine/engine set power generation units  including additional stand-by units if desired. The steam plant could be run off gas turbine exhaust and/or FBC flue gas as appropriate. A hybrid plant will require integrated unit operations and sophisticated control systems, so its relative CAPEX and OPEX will be higher than simpler systems. The ability of the total system to utilise wastes in the generation of electricity is a positive, and if green credits can be gained from VAM destruction so much the better. The CDM economics of generation using coal wastes and VAM are described in the UNFCCC methodology, ACM 0008 . The methodology is a pathway for calculating the carbon credits from power production using VAM and supplementary fuel. The carbon output from combusting the carbon contained in the coal wastes and converting the VAM to carbon dioxide will need to be considered in terms of the lower efficiency of conversion of the wastes fired plant (28% as against 36% for a modern supercritical PF power station). Avoiding the rejects levy of $15/tonne will have to be balanced against the additional carbon tax, if/when applicable, between generating a given amount of electricity from a traditional higher efficiency unit versus a coal waste fired unit as described in this article. The GHG credits earned from methane destruction will, like the avoidance of the carbon levy, be positives in the project economics. In New South Wales the conversion of coal washery wastes into clean ash that can be pneumatically or hydraulically disposed of in a mine, or possibly sold for brick or cement manufacture, should remove the liability of the washery waste levy. The possibility for positive cash-flows from sound waste management should be attractive to mine managements. The clean ash can also use in mine reclamation of current workings and abandoned workings. It can be as used a sealing material where spontaneous combustion is hazard or to a lesser extent as an acid mine control measure. The poor management of wastes associated with coal mining is increasingly been seen as a risk to the coal mining industry and industries such as coal fired power generation. The better management of the wastes needs to be an industry priority, with both solid wastes and VAM utilisation being parts of the challenge. Hybrid systems that can utilise both solid wastes and VAM offer superior energy conversion efficiencies over a range of total plant sizes. They can efficiently destroy VAM, produce a clean ash and recover otherwise lost energy values. Such plants have significant energy resource conservation potentials as well as excellent environmental footprints. The destruction of VAM has the potential to earn carbon credits. The destruction using coal wastes as a supplementary fuel will in itself produce carbon dioxide. The UNFCCCs ACM0008 methodology provides a pathway for calculating the overall GHG benefit (carbon balance) and thus eligibility for claiming credits. The accurate and monitored use of the tool should also provide evidence of coal washery reject use in resource recovery that should satisfy the NSW authorities that levy contributions should be waived for the reject that has been used in power generation. 2. "Consolidated methodology for coal bed methane, coal mine methane and ventilation air methane capture and use for power (electrical or motive) and heat and/or destruction through flaring or flameless oxidation". Approved consolidated baseline and monitoring methodology ACM0008, UNFCCC April 2009. 3. Per com: Peter Davies, Real Power Systems, ACT, Australia, June 2009. 4. Mallett C W and Su S. Progress in developing ventilation air methane mitigation and utilisation technologies. CSIRO (Australia), web published, January 2004. 5. Changfu You and Xuchang Xu. Utilisation of ventilation air methane as a supplementary fuel at a circulating fluidised bed boiler. Environmental Science and Technology, Vol. 42, No 7, 2008, pp 2590  2593.